Great place, nice cottage, great pool and playground and very friendly hosts! We had a great week! The kids loved playing in the pool, on the trampoline (with Declan) and rest of the huge playground. The cottage was very well equipped and charmingly styled, French with a touch of Britain ;-). We will definitely return another time for great week! We would surely recommand this accomodation, especially with children! 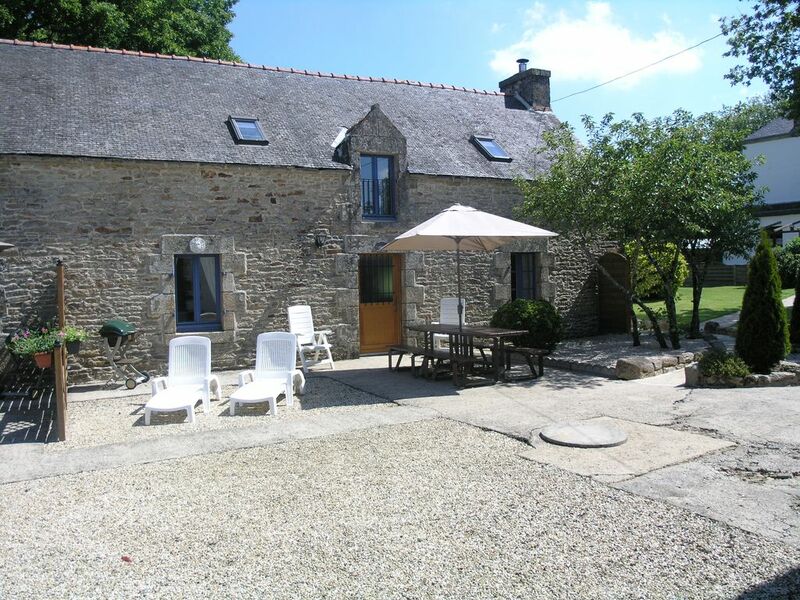 We had a fantastic holiday at Vine Cottage, the Gite is well laid out and has everything you need for a great stay. Grounds and pool were excellent, could not have wished for anything better. Joanne and Aidrien are great hosts, lots of information available on where to visit and places to eat. Carnac, Trinite sur Mer, and the chateaux at Josslyn were some of the places we visited and really enjoyed. We all loved every minute of our stay. Hopefully we will return soon. Thanks for a great holiday and we would certainly recommend the property to family and friends. Authentic, relaxing & beautiful place ! We spent 1 week in the Vine Cottage. We had a really good time. We were 5 (3 children), the cottage is well equiped (all equipment for the baby) with a large living room, kitchen & rooms. Clean, nicely decorated we enjoyed to stay in the cottage. Outside you can do your barbecue and relax ! There is big garden with lots of activities for children. They played every day. It's tottaly secured. The Cottage is also well located 30-35km to the first beaches, you can also enjoy the swimming pool. We had a warm welcome from the owners. We met 3 different nationalies during our stay (Belgium, Germany, England) + us French,...so nice. We will do it again. Charming stone cottage in a tranquil setting. On our arrival we received a warm welcome from Joanne and Adrian. Vine cottage is a charming stone property equipped to the highest standards and impeccably clean. The setting is tranquil and unspoilt with open countryside all around, yet the nearest town is less than 10 minutes away. Sitting on our private patio drinking a glass of chilled wine I realized there was more to this unique place than just a group of cottages and a swimming pool. As a patron here I was not just buying a holiday in a gite, but like everyone else I was buying an experience, and as a result I would thoroughly recommend these charming gites. This was the third time we had returned to these properties which say it all really. We are a large group of 16 and had previously struggled to find anywhere which allowed us our own space yet be together, La Metairie was perfect for this. The cottage was spotlessly clean, the children love the garden with playhouses, trampoline, heaps of games etc and the pool. Joanne and Adrian are really welcoming and as always nothing is to much trouble. I can highly recommend this lovely property. Travelled with friends and their children, 8 adults & 11 children/teenagers. There is a clean, warm pool which provided hours of entertainment, a large & small trampoline & a large lawn for football & tennis. Vine cottage has a large lounge & log burner big enough to keep ~15 people warm & cosy on cool evenings. Close to lots of Brittany's attractions, Auray market fab, & children loved go-karting near Carnac. Many thanks for the review Kim, it was lovely have you all stay with us and hope to see you again in the future.